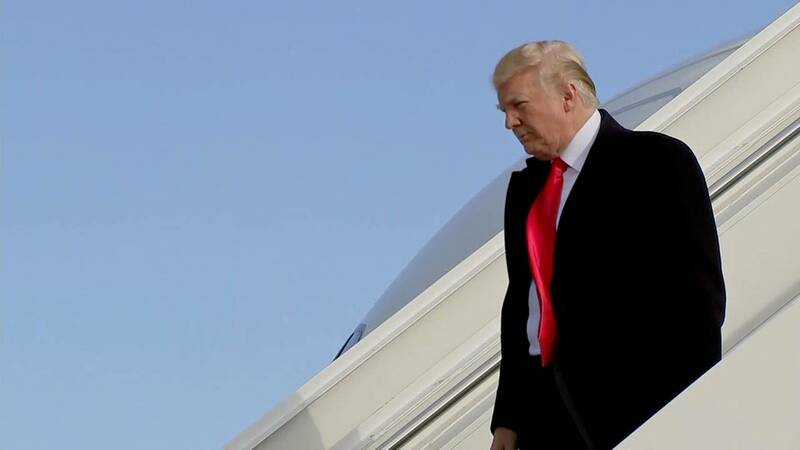 President Trump arrives in Flint, Michigan on April 28, 2018 for a rally to speak to supporters. WASHINGTON (CNN) - President Donald Trump, in a characteristically free-wheeling speech Saturday night, called out several Democrats by name as well as former FBI Director James Comey. "They've got to be voted out of office," Trump said of Democrats as he blamed the party for a range of issues. "You people just keep putting her back again, and again, and again," Trump said. "It's your fault." Trump also tossed out an unspecified allegation about Montana Democratic Sen. Jon Tester, whom Trump blamed for the recent sinking of his nominee to lead the Department of Veterans Affairs. "I know things about Tester that I could say, too," Trump said. "And if I said them, he'd never be elected again." Trump called for Tester to resign earlier Saturday after the Montana Democrat came forward with a slew of allegations and concerns about Ronny Jackson, the White House physician who withdrew from consideration for the top VA post on Thursday. Trump also turned to Comey, the man he fired as FBI director last year who has since written a book and launched into public criticism of Trump's leadership and morals, as well as the investigation into potential coordination between his associates and Russia. "Watch the way he lies," Trump said, adding shortly after, "I did you a great favor when I fired this guy."